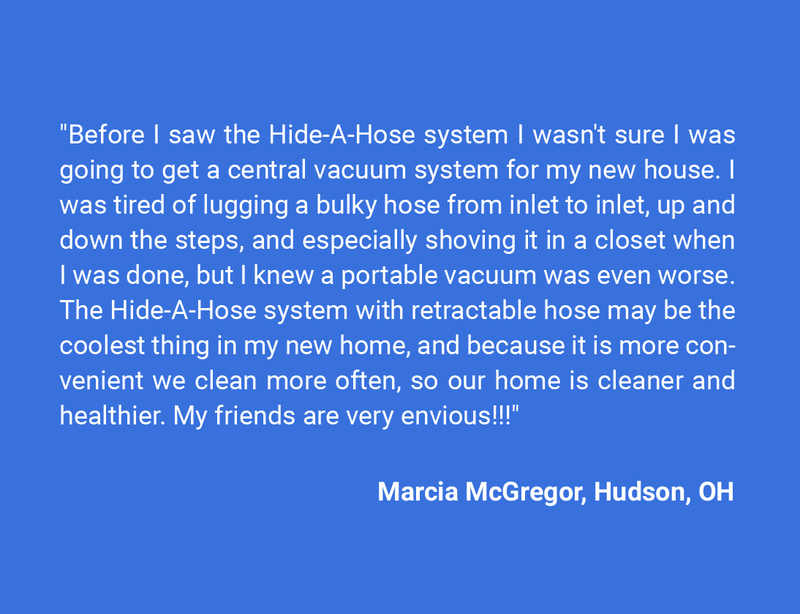 Hide-A-Hose solves the problem of carrying and storing a central vacuum hose. You’ll never have to carry or store a bulky central vacuum hose again. Simply pull out the amount of hose you need from the inlet valve, connect your cleaning wand (with attachment) and begin vacuuming. 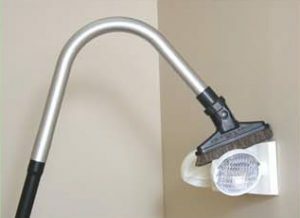 When you’re finished, detach the cleaning wand from the hose and the suction from the central vacuum power unit retracts the hose into the tube system hidden behind the wall. When the vacuum hose is not in use, it is stored inside the PVC tubing that is hidden in your walls or attic. Hose lengths are customized according to the size of the floor. Each inlet can cover up to 700 sq feet for a 30 foot hose and up to 3000 sq ft for a 60 ft hose. With the hose safely stored within the walls, you need to only carry your handle and tools to the next inlet and repeat the process. Each inlet stores it’s own hose. Installation for newer and existing homes is simplified with the reduction of inlet valves needed on each floor. 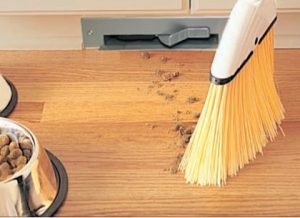 Fewer inlets will save time and make vacuuming more convenient. 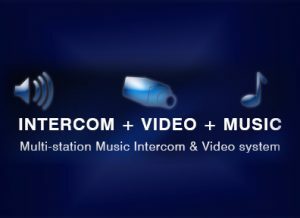 Requirements for installation vary by each application. These systems require more room for the pvc piping. It is important to install the pvc on a single plane and need to use special long radius fittings. The Hide a Hose uses standard 2″ PVC central vacuum pipe and standard fittings for the completion of the network that is outside of where the hose is stored. Hide A Hose systems can be mixed with standard central vacuum inlets and sweep inlets to meet the needs of the application. No more dragging a hose from inlet to inlet. No more carrying, coiling and storing a bulky hose again. 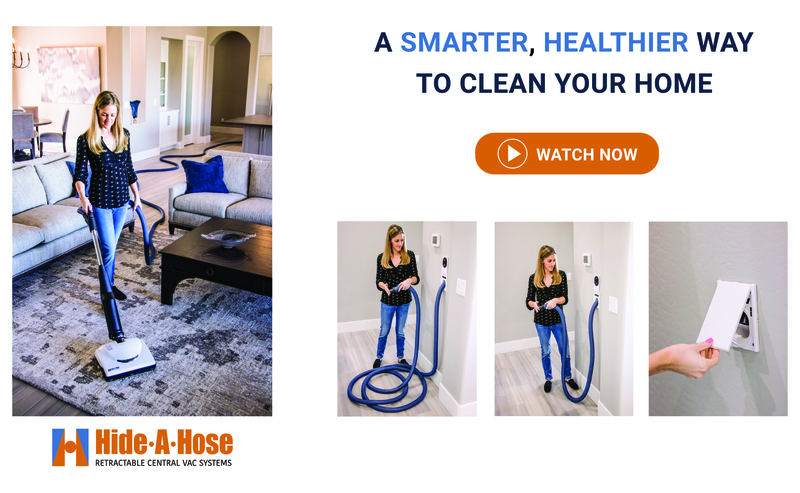 Simple cleanups are easy.The Hide A Hose system is available in four lengths, 30ft, 40ft, 50ft and 60ft and two styles rapid flex and hose with sock. Each inlet point requires a mounting bracket, inlet valve, and hose. Installation is similar to standard vacuum inlets with a few special installation requirements. 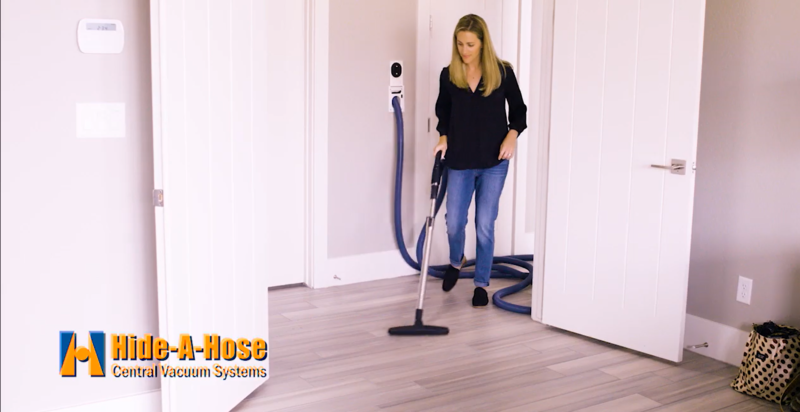 The Hide A Hose uses special elbows for turning which allow the hose to travel smoothly in and out of its storage position. To complete your system it may take several inlets with hoses, but only one handle (standard or RF) and attachment kit are necessary. All the tubing is connected to a central power unit usually placed in the garage, basement or equipment room. Installation is simple and easy for new construction or for retrofitting an existing home.